Rojava’s economy has been much discussed. Rojava has been lauded by leftists all around the world to be some kind of communal, confederal socialist utopia unparalleled by anything else existing around the world right now, so the question of how the economy in such a mystical place might be organized seems to be an important one, and it already has been the source of much controversy, both in and outside Rojava. First however a bit of definition. Rojava means “West” in Kurdish and stands short for Western Kurdistan, a denomination for the Kurdish territories within the borders of Syria. The question of what territory is and isn’t Rojava has been debated both among different Kurdish political factions as well as among Kurds and other peoples inhabiting the region. Relevant to this article however are the regions that at any given time were part of the Xweseriya Demokratîk (Democratic Autonomy) self-administration, and later the North Syrian Federation, which is the current political framework of the social revolution in Rojava and northern Syria. The area is part of the fertile crescent and mostly located between the Euphrates and Tigris rivers and the Tauros mountains to the north. This larger region of Mesopotamia has by all likelihood been the site of the agricultural revolution during the neolithic period, and agriculture is the most important economic activity in northern Syria until today. The feudal socioeconomic fabric made up of rural and partly nomadic tribes did not change much until European colonization began in the 1920s, although an important factor was the influx of Assyrians, Chaldeans, Armenians and other Christian minorities that had survived the genocide in Turkey, settled in the plain of northern Syria and founded some of the first cities, such as Qamişlo, one of the economic centres of the region today. Many of them came from towns and cities themselves and followed more urban professions, working as merchants and artisans. The French colonizers participated a lot in shaping and expanding cities such as Qamişlo or Heseke, and the construction of the Berlin-Baghdad-railway spawned many more new settlements along its course, the most notable of which is Kobanê. The railway was soon to become the demarcation line of the border separating the new states of Turkey and Syria. Upon its establishment it split many settlements into two, the biggest being Qamişlo, and it divided the families, communities and peoples that lived on both sides of the railway. This forced separation had a huge impact on the region’s development and was no less severe than the ones between North and South Korea, East and West Germany, and countless less well-known others that were the result of imperial colonialism. The next big change arrived in the 60s and 70s when the Baath regime took power. The Baathists eagerly set out to create a centralist planned economy in which they designated north-eastern Syria as the nation’s breadbasket. The communal, traditional mode of agricultural production was replaced by huge industrialized wheat monocultures in the hands of state companies that relied heavily on chemical fertilizer and pesticides. To a lesser extent cotton was being grown. Toward the west, in the more mountainous countryside north of Aleppo agricultural production remained more diverse, with many different kinds of fruit and vegetables being grown, and less industrial. Throughout the Kurdish regions orchards of olive and pistachio trees were prominent, but many of them were cut down, first by the state and later by locals in need of firewood. Husbandry of sheep and goats continued into the present, although most of the nomadic shepherds were forced to settle down eventually. Next to agriculture, crude oil exploitation and later mineral gas emerged as the new big business, especially in the very north-east of the country. The state did however not look favourably on the region, largely because of its remoteness from the country’s heartland and the Kurds’ rebellious past. All processing industries for the region’s produce, such as mills and refineries, were built far away, in Homs, Hama and Aleppo. The oil was extracted, the wheat grown, then carried away to the centre, and later diesel and flour were sold again to the people who had produced the raw material. Rojava shared the fate of many regions and countries whose economy relies on the production of raw materials, in that it remained completely dependent on the entities that processed its produce as well as provided it with all other goods, even more so as there was no degree of autonomy whatsoever that would have allowed for an own economic initiative. On the contrary the state made a continuous effort to keep the region as dependent as possible, by denying citizenship to Kurds and other minorities, persecuting members of political organizations and trade unions that were not part of the Baath party, cutting down many trees to eliminate economic self-sufficiency, and making it virtually impossible to build anything higher than one storey or even plant a tree without the explicit permission of the authorities and a party membership. The greater Aleppo city became Syria’s first big industrial hub and remained the nation’s most important commercial and economic centre even during the war. Many people from Rojava and northern Syria, mostly impoverished farmers and shepherds moved to the urban centres, of which Aleppo was the largest and closest. The Kurds and other minorities usually set up shop in separate neighbourhoods, like Şêx Meqsûd and Eşrefiye in Aleppo or Zorava and Kurdan in Damascus. Also people pursuing higher education had to migrate to the bigger cities. The northernmost universities existed in Aleppo, Raqqa and Heseke. In the 90s and onward the Baath regime carried out some neoliberal reforms while keeping the core of the authoritarian centralist state intact. While foreign companies partly replaced the state-owned businesses the overall mode of production remained the same. At the beginning of the uprising in March 2011 Rojava’s main products were wheat, cotton, crude oil and mineral gas, to a lesser extent other agricultural products such as meat, olives, pistachios, eggs and different dairy products. Öcalan is overquoted, but I will do it one more time. He compares society to a field. If you grow a monoculture you will need fertilizer, pesticides, a fence, industrial equipment and so forth or the crops will die. In society this is the state. A monocultural, or nationalist, society cannot exist without a state because it is weak like the crops on an industrial plantation. If you plant different crops together however, according to the principles of permaculture and agroforestry, the field will become an ecosystem which regulates itself and is in no need of meddling, much like a healthy, diverse society has no need for authoritarian institutions. Today humans try to regulate and “domesticate” ecosystems in various ways, just like they try to fix social problems with clever policies, sophisticated legislation, war or other external methods that disregard society, its origins, dynamics and complexity and reduce billions of people to passive subjects of the schemes of a disconnected class of “managers”. In both cases it is the same process of splitting the world into a passive, inanimate mass to be subjugated (nature, women, humankind, “the people”) and an active dominator (man, god, government). Emancipatory theory rejects this positivist, patriarchal and materialist ideology. But to break the power of the external regulator, the group in question must of course become active, self-organize and shape its own ecosystem in order to make the constructs of power redundant. Economic autonomy is therefore crucial in achieving any substantial change of the status quo. The moral, ethical concept of solidarity must be developed and internalized before any group can satisfy its material needs in a truly egalitarian way. When the regime forces left left town after town in Rojava beginning 19th of July 2012 the state companies were expropriated and the councils took over control of the agricultural land. The new administration was built around newly created communes that mostly consisted of a village and the surrounding hamlets. The communes distributed the land among its families according to need and ability to manage it, some pieces of land remained in the hands of the higher councils to become ground zero for the first cooperatives. The first winter of the revolution was very hard. Because of a lack of mills bread became so scarce that some areas of Rojava suffered from famine. Many of the remaining trees were cut down for firewood. Because of the inability to import many of the much needed goods and machinery economic development happened at surprising speed with the aim of providing basic self-sufficiency. This included the construction of makeshift mills and refineries, a huge boom in small-scale business and trade and a general construction boom, things that had been impossible under government regulation. Farmers started growing vegetables and spices, mostly for personal use, now that they were free to manage the use of their land, but in many places the knowledge of traditional agriculture had been diminished under Baath rule. Almost all of the land continued to be used for growing wheat, which was needed both in Rojava and in Syria in general as a main food source. In consequence the mode of its production also remained industrial and reliant on imported pesticides and fertilizer. Wheat seeds continued to be produced by a state company in Dêrik. The state remained involved in the oil industry which the councils had no means of managing themselves. They relied on the government’s engineers and its maintenance of the industry’s infrastructure. The revenues were split half-half between the state and the Xweseriya Demokratîk, in addition the state provided Rojava with some refined diesel and gasoline. It must be remembered that institutions of the state have been present in Rojava after the Revolution, some until today. For one thing it was impossible to take over management of all spheres of public interest immediately. Also it was inevitable for the Xweserî (autonomy) to make some concessions to the state to avoid large-scale military confrontation, as the Syrian Arab opposition was at the time unwilling to recognize Kurdish autonomy or cooperate with the forces that represented it. Finally, pushing out all of the state’s institutions wasn’t desirable from a revolutionary point of view. When Riza Altun, senior diplomat of the KCK, was asked in an interview with Al Monitor in 2016 about Rojava’s cooperation with the Syrian regime, he answered that pushing out the state entirely and all at once would make the creation of a new, separate state inevitable. As the aim of the revolution is precisely to avoid this it is necessary to tolerate the state’s presence in some fields, until there is a democratic way of organizing them. The state remained in charge of the healthcare, water, electricity and education systems for some time and kept operating several other civil institutions including municipality offices in some cities, at times parallel to the new Xweserî institutions that bit by bit made them redundant. Today primary education and local healthcare are organized completely autonomously, as are large parts of the secondary and university education, water and electricity grids, and many hospitals. The more central councils of the Xweserî have never tried to exercise strong authority over the economic development. There has never been a tax on business or trade, the main income of the Xweserî coming from former state businesses taken over by the councils. There have been very few expropriations apart from those concerning state property. The most notable economic policies have been price limits on basic goods such as flour and sugar, the establishment of social welfare services and the proclamation of the workers’ right to self-organize along with many other liberalizations that were de-facto the removal of the state’s regulations. Rojava’s revolutionaries, the Apocî, have never had a monopoly on social or political power within Rojava. The Baath party and the KDP, different tribal and religious leaders, and also some Islamist factions had significant bases of power in Rojava at the beginning of the revolution. Especially the KDP, who had long had a strong presence in Cizîre, tried to take over power within the Xweserî and push for reactionary, nationalist, economically neoliberal policies and, when it lost more and more influence to the Apocî, resorted to implementing an ever more total embargo on Rojava together with Turkey, launching a massive medial defamation campaign, and a few times terrorism. The electricity grid in Rojava had never been developed properly, and with the state unwilling and unable to provide more than a few hours of electricity a day to selected communities, the councils started using diesel generators to provide power. After expropriation of the state departments these generators were originally operated by electricity offices of the cantonal economic committee, later by the communes and neighbourhoods, with the offices remaining in charge of some generators in public places such as markets. Large parts of Cizîre are supplied with power from large generators in the town of Rimêlan. Electric power remains a problem as it is very difficult and expensive to import replacement parts for the mostly very old generators, while the deterioration of the machinery is accelerated by low-quality diesel. The QSD’s capture of the Tişrîn hydroelectric dam reduced the power shortages in Kobanê and western Cizîre but with the Euphrates carrying very little water, largely because of Turkish interference with the flow of the river, greatly reduces the power plant’s efficiency, and sabotage by Daesh and possibly other parties has greatly delayed the construction of grids able to supply larger parts of Rojava with power from Tişrîn, thereby making a continuous reliance on diesel generators inevitable. Water supply has somewhat improved over the last years, however Turkey interrupting the flow of streams and rivers into Rojava still leads to serious water shortages. Additionally, over the course of the last decades wells have been dug excessively all over the region, greatly depleting the ground water reserves. In some arable areas the wells are now more than 200 metres deep, in others the water is too sour for consumption because of contamination from industrial fertilizer. The embargo against Rojava has been a kind of externally forced protectionism that enabled parts of the local economy to develop. But the negative impact of the war has been much greater, with still over three quarters of total revenues going into the war effort. 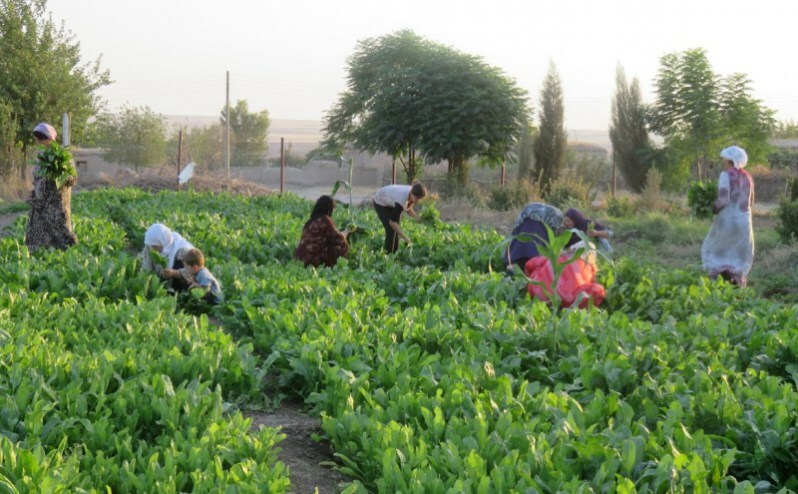 Nonetheless Rojava’s revolutionaries have seen the establishment of alternative economic institutions as essential and pushed from the beginning for the creation of cooperatives and other models of communal economy. The cantons allocated funds to finance new cooperatives. Once they were operational they returned 30 percent of their revenue into the fund. Most cooperatives are farmer cooperatives, a few own cows and sheep and produce dairy products. To a lesser extent there are cooperatives producing clothing, running gastronomic and other service sector businesses, and trading goods. The reception of the current cooperative model has been somewhat mixed so far, with less than 100,000 of the Federation’s estimated 4.5 million inhabitants being active members of a cooperative. The cooperative model of economy is by far the most successful in Efrîn, where the economy is the most diverse but the embargo also the most total. Women’s cooperatives are growing in size and number, as they are an important way for women to become less and less dependent on their fathers or husbands. In general the ongoing struggle of women’s liberation has also influenced the economy in that for the first time in modern times women can participate on a large scale and independently in the economy, and be economically independent from their families. Overall the prevalent roles of women are still traditional ones centred around housework and motherhood, but the percentage of women following different paths is rapidly growing. Faring best are villages that have formed Economic Communes. Economic Communes are the synthesis of the cooperative and communal models. The term refers to a community that does not only cooperate in a certain economic activity like a cooperative would, but communalizes all its property and collectively organizes to satisfy the community’s needs and demands. There are only a few such communes right now, however the Xweserî’s higher councils reached a decision in spring 2016 aiming for 50 percent of Rojava’s villages to become Economic Communes within two years. This will be achieved through incentives like subsidies from central funds and heavy support from all kinds of different revolutionary institutions – municipalities providing tools and machinery, trade and production cooperatives offering reduced prices, trade unions assisting with engineers and specialized workers etc. Villages who prefer to stick to a capitalist economy are free to do so but will be excluded from the communal economic network. One of the criticisms most often voiced in the Xweserî’s and now the Federation’s councils is the lack of ecological development. Despite being one of the revolution’s core principles and achievements in ecological education and the establishment of some protected natural parks the economy has made almost no progress in becoming more ecological and sustainable. The main reason is the inability to move away from industrial agriculture under the current conditions of war and embargo. After a severe scarcity of much needed fertilizer the Cizîre canton economic committee took a first step by starting to build composting plants in the towns of Til Temir and Tirbespiyê, with the plan of creating more such plants all over Rojava if the first ones prove to be effective in producing ecological fertilizer. If the model is successful it will not only make the Federation largely independent from importing fertilizer but also replenish the soil which has become much less fertile through decades of monocultures and chemical fertilizer. In the first years Rojava had very little industry – most notably a few clothing workshops in Efrîn, a couple of small factories producing snack food, soaps, plastic bottles and other plastic items in Amûdê, Qamişlo and Dêrik. Also there were many smaller workshops for vehicle repair and maintenance and some little larger ones that made agricultural machines and replacement parts for different kinds of machinery. Quite a few mechanics and engineers from these workshops have shown themselves to be exceptionally skilled and inventive as they can be credited with building many of the tanks, armored vehicles and weaponry, including mortars and cannons, that Rojava and the YPG became known for internationally. In the last years the YPG’s and QSD’s huge advances have brought more industrial cities like Heseke and Minbic into the Federation. Many of the factories there have been destroyed by Daesh when they retreated, others have been looted and yet others cannot be operated because the engineers who understand the machinery are all gone or because they process material that doesn’t exist in the Federation and can’t be imported. The economic committees are working hard on getting the most important factories running again by procuring the needed spare parts, workers and engineers, which has led to several textile and rope factories resuming service. With an ever stricter embargo imports of various needed goods became dependent on big merchants in South Kurdistan. The KDP allowed only merchants allied to it to export to Rojava – merchants who demanded horrendous prices. These merchants sold their goods to other merchants in Rojava, who sold to the markets, making the profit margins huge as these merchants had a monopoly on import. To combat this trend the economic committees formed the Kooperatîfa Hevgirtin, the Solidarity Cooperative, with chapters in all major towns and cities. The chapters are funded by a large base of citizens who are cooperative members, the Hevgirtin then acts as a big merchant itself, buying the goods directly from the South Kurdistan merchants and selling it in special shops that exist in all towns with Hevgirtin chapters and are run by them. Cooperative members can buy goods at exactly the original buying price, while everyone else pays just a little more. This model worked quite well until the KDP forbade its merchants to sell to the Hevgirtin, forcing the Hevgirtin to buy from intermediaries, which in some cases caused the Hevgirtin price of a given good to be higher than the regular market price. The Hevgirtin is still operating though, its shops open six days a week, offering many products at affordable prices, mostly goods produced inside the Federation. Despite the embargo the Federation still imports different consumer goods from South Kurdistan, and exports live sheep. From Aleppo, which despite the war has remained Syria’s economical centre, construction materials and different industrial and mechanical goods such as fuel filters, machine parts, tools and motor oils are imported, as well as a variety of other items. From Damascus the Federation imports medication, electronic products and others by aeroplane. From Idlib, Latakia, Raqqa, Deir ez-Zor and other parts of Syria vegetables, other food products and construction materials are imported. The Federation exports wheat, crude oil, gas and some other agricultural products to other areas of Syria. It should be noted that all different factions of the Syrian civil war are somehow doing business with each other, although they are not very keen on advertising this fact. The only nearby country interested in direct trade with the Federation is Iraq. The development of the war in and around Mosul is very important in that way as, if the Iraqi central government would take control of the border crossing between Şengal and Hol, there would be a direct route for trade with Iraq and much of the embargo’s pressure could be lifted. The Meclîsa Sûriya Demokratîk or MSD, Council of Democratic Syria, put forward a comprehensive proposal for the solution of the Syrian crisis in early 2016. It outlined the re-establishment of Syria as a confederation of different autonomous regions, united by a common constitution and diplomatic representation. Next to the creation of a Kurdish-Arab federation in the north it suggested a Sunni Arab federation in the east and centre, an Alawi federation in the west and an autonomous Druze region in the south. All ethnic, religious and social groups would retain the right to autonomously self-organize and manage their own affairs within the lines of the fundamental principles outlined in the constitution. The proposal included a framework of fair distribution of resources between the regions, so no region would have to import something as long as it was available in one of the other regions. The MSD proposal remains the only real plan out of bloodshed and misery until today. All attendees of the futile peace conferences could agree on nothing but that “the territorial integrity of Syria” be preserved, and put forward nothing but the demand to place their candidates at the top of a state that failed long before 2011. The Federation’s economic problems can only be solved if the war in Syria comes to an end. Major irrigation channels need to be dug from the Tigris and Euphrates to alleviate the water shortage, plant a green belt in the south against desertification and enable an ecological agricultural revolution. The experiments with solar energy, biogas and other renewables need to be put into practice in order for the energy crisis to be solved. These and many more steps that need to be taken require open trade routes and conditions under which total destruction through bombardment and invasion is less likely to occur. The Apocî are the only large united force that have remained true to the promises of the Syrian revolution. The Arab revolutionaries have largely been destroyed or marginalized by Turkey-backed Salafist groups. But the Federation’s autonomy and relative peace might not be anymore very soon. Its reluctant American ally seems determined to leave the Syrian theatre, clearing the way for a full-on Turkish invasion. At the same time Iran has used its influence on the Baath state’s armed forces to provoke a war with the Federation numerous times by attacking it in Qamişlo and Heseke. For many weeks the YPG-held neighboorhoods of Aleppo have been completely surrounded by the state’s forces, an ultimatum to leave the city passed on 31st of December 2016. The negotiations going on between Turkey, Iran, Russia and the Baath state are a very sinister development indeed. The dream of the Middle Eastern uprisings, of the Syrian revolution, will perish if the Syrian people do not take up the cause of Democratic Autonomy and confederal revolution. The Federation at the same time must greatly improve its public outreach and make its ideals, its ideas, its hope known to the greater public in the Middle East. More honest and more critical media outlets are needed for that. The revolutionaries of the Middle east – just like the revolutionaries everywhere – can only succeed if they are united. The window of opportunity is closing fast.